The Helios Prototype aircraft flying above cloud cover at approximately 10,000 feet, northwest of Kauai, Hawaii. DARPA's Vulture is yet another of the agency's blue sky programs, this one maybe more than others. Vulture is intended to fly for periods of up to five years unattended at 65,000 feet. The VULTURE Air Vehicle Program is an exploratory development program with the overall goal to develop and demonstrate the ability to deliver and maintain an airborne payload on station for an uninterrupted period exceeding 5 years using a heavier-than-air platform system ... The government is not interested in approaches that use either radioactive energy sources or employs any form of buoyant flight for this application. The intent is that DARPA's Vulture would orbit over a small, well-defined area (like a battlefield) and provide continuous coverage of that area. Vulture is intended to operate in a manner similar to a satellite, except that it has the advantage of not being bound by orbital mechanics. The only satellites that can remain stationary over one spot must orbit at 22,240 miles — and this trick works only along the equator. Low-flying spy satellites scoot quickly over their coverage area. If the Vulture can be accomplished, you would see dramatic increases in sensor resolution and communications capability. I can't understand why none of the articles I read on this program include references to the amazing Helios program. Helios is a single wing, solar-powered aircraft that has performed admirably above Hawaii in tests performed in 2001. 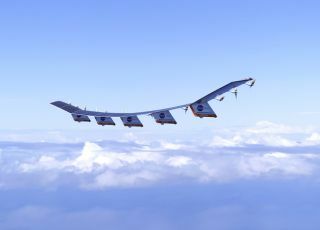 Helios is essentially an ultralight flying wing with 14 electric motors built by AeroVironment Inc. Helios' 247-foot wingspan exceeds that of a Boeing 747. Operating entirely under solar power (including the take-off), Helios reached an altitude just short of 100,000 feet, which broke records for non-rocket powered flight. At that altitude, Helios approached conditions for winged flights in the atmosphere of Mars. It's not quite the same thing, but both the DARPA Vulture and Helios remind me of the Flying Wing from Triplanetary, the 1934 novel by 'Doc' Smith. The Flying Wing was also able to fly to near-space. Writer E.B. White got very close to the Vulture idea with his description of the Stratovideo, in his scarily prescient 1950 story The Morning of the Day They Did It. Via DARPA pushes limits of unmanned aircraft capability to extremes. See also the DARPA Vulture project description. Here's a nice DARPA science-fictional project list; also, if you're not familiar with Helios, check out this awesome Helios picture gallery.